Trying to explain Ayurveda in an “elevator pitch,” that is to say, in one or two minutes, is nearly impossible. It’s hard to encapsulate a discipline like Ayurveda, which by its very nature is all-encompassing. Given that, here’s my best shot. You may have heard of traditional Chinese medicine, things like acupuncture, chi and the like. This tradition has made its way into Western culture more than Ayurveda, which is essentially the Indian system. Ayurveda is often referred to as a sister science to yoga, as they come from the same tradition. In fact, in the timeline of our understanding of yoga asana (poses), Ayurveda precedes yoga. Ayurveda categorizes everything–our minds, bodies, interactions, natural world, food, energy–as comprised of a mix of five basic elements. Earth, water, fire, air and space (sometimes called ether). Each person has a unique constellation of these elements in his or her body and mind, a pre-set constitution determined at the moment of conception that remains in place throughout one’s life. This is your dosha, or Prakriti. Essentially, this means that if you already have more fire in your make up, it will probably be the first element to go out of whack. This is particularly true when you combine an understanding of those five elements with the seasons. As you might expect, summer is fire/Pitta season (think hot, humid days); fall and early winter are air/space or Vata seasons (think: windy and cold), late winter and spring are earth/water or Kapha seasons (think: heavy, wet snow and ice). So if I’m a Pitta person, summer is likely to be a challenging time for me, as the fire in the external environment is increasing, the element of fire already present in overabundance in my body/mind will ramp up too. This can leave you feeling high Pitta symptoms: irritable, quick-to-anger, envious, gossipy and really competitive. In the body, you might feel a front of the head: acne, headaches, an acid stomach, or diarrhea, to name a few. The elements in an individual’s constitution can also be affected by lifestyle, diet, exercise and essentially all the variables of life. So in Ayurveda as in life, there are no hard and fast rules. (Rats! That would make it so much easier, huh?) 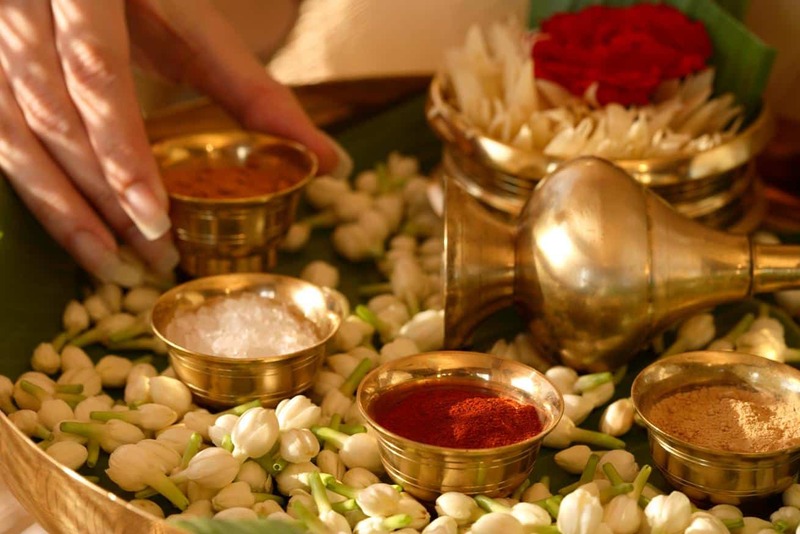 Thus, bringing your body and mind into balance, Ayurvedically, is always a moving target. You never “arrive,” a good notion to give up anyway. A basic tenet of Ayurveda is “like increases like.” Therefore, to balance your mind/body, applying the opposite quality will bring you more toward the center line. Think of qualities as how they represent the elements. For example, if I am a Pitta (high fire) person by nature, sweating and pushing through a super hot Bikram yoga class in the middle of the dog days of summer is not going to bring balance to my body or mind. It will only increase the fire element that is already there. This is where it gets tricky. Though an intense physical practice (or whatever your equivalent is—a long, hard run; a competitive sport; a hot, spicy meal; a heated debate) may feel good, it is working to increase fire, which, as a Pitta, I need to rein in. In that way, a Pitta during summer particularly will find more balance by steering away from hot, super-rigorous yoga, and find more balance with a practice with poses to calm and cool the body and mind (twists, forward bends emphasizing long, fluid breath). Same goes with what foods you’re eating and stimuli or lifestyle you expose yourself to. It all affects the elements, because everything is made up of the elements. Ayurveda teaches us that if a dosha (our unique individual make up of elements) increases too much, it fosters an environment where disease can take hold. So, keeping our eyes turned toward balance remains an important focus, and at the same time, something we never really achieve, just work toward. It is common for our predominant dosha (Vata, Pitta or Kapha) to increase more quickly than other doshas because we tend to do and live with what we know best. For example, if your dominant dosha is Kapha, due to the slow, earthy quality of Kapha, you may be naturally inclined toward calming activities. If you’re not moving enough, eating lots of cool, dense foods (ice cream, mac n’ cheese, creamy casseroles, or cheese and other dairy (especially when cold). If your dominant dosha is Pitta, you may be naturally inclined to rigorous exercise (hot yoga), competition, envy and find yourself constantly moving toward achieving. Look around the room in your next hot yoga class. You’re likely to see a room full of Pittas. The Pitta person loves the rigorous, challenging nature of the practice (as a Pitta myself, I know this impulse well), but that type of practice will throw Pittas out of whack more than any other type. That’s the rub. For example, if Kapha has increased due to excess stagnation in your life, more activity can be your medicine. If earth/water have increased due to excess coolness, you can use heat as a medicine. Too much heaviness? Use lightness. See how that applying the opposite quality thing works? One of the practical aspects of Ayurveda is that anything can be used as a medicine because everything that exists is made up of the elements and their inherent qualities. This includes but is not limited to: herbs, foods, drinks, environments, colors, smells and lifestyles. As you can see, writing a primer is tough, because Ayurveda pervades nearly every aspect of life! For now, we’ll start here. If you’re interested in learning more about your Prakriti (individual make up of the elements that sustains over a lifetime) or Vikriti (current imbalance), Breathe Deep Naturals has a nice self-test. It’s often a good idea to vet your responses with someone who knows you well to make sure you’re seeing yourself clearly. If you find your Prakriti is difficult to discern, listen to your intuition. What qualities are the most like you, over the course of your lifetime. This entry was posted in Ayurveda. Bookmark the permalink.